CE approved and better fit! These motorcycle gloves are an upgrade of their previous model. There's more adjustment on these gloves, that feature a new type of adjustment that we've never seen before. You can adjust the fit of these gloves across the back of your hand to get the perfect fit. 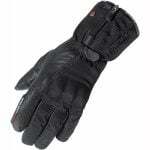 They're ideal for autumn and spring riding thanks to a thermal liner and reliable Gore-Tex membrane. Gore-Tex grip means that these gloves feel much thinner, so if you're something that doesn't like bulk, they're ideal for you!